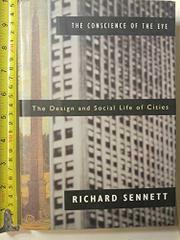 In a critique of urban art (baroque churches to subway graffiti), architecture (Renaissance obelisks to the Union Club and Le Corbusier), and the social rituals that take place around them, Sennett (Sociology/NYU) brings an immensely civilized perspective to the forms and patterns--the visual experiences--of cities, primarily New York City, interpreting how they shape, reflect, or, sadly, fail to reflect the human beings who build and use them. As in earlier works (e.g., The Uses of Disorder, 1970; The Fall of Public Man, 1977; Authority, 1980, and the novel Palais Royal, 1987), Sennett explores the creative and psychological possibilities and penalties of urban life. In place of such dominant forms as the grid ("the geometry of power," disguising an inner emptiness) or the glass building (visibility that isolates), he proposes the Ideal City of Deconstruction, derived from Derrida's aesthetics--a city that celebrates differences, discontinuities, disorientation rather than serving as a refuge from them. The theory is like the steam in the Turkish Bath on the Lower East Side that this author deconstructs so skillfully: a pleasant obscuration. Sennett's strength is in his illustrative material-ranging, diverse, apt--from St. Augustine to James Baldwin, Adam Smith, Henry James, Balanchine, Allen Ginsberg, Sarah Bernhardt, and Hannah Arendt. The best parts are the autobiographical excursions up Third Avenue (pausing at an equestrian supply store politely selling whips to Connecticut matrons and the local S/M crowd) or among the peddlers of 14th Street, as Sennett savors and interprets a city he obviously loves. Provocative and learned--but such a visually oriented book suffers from lack of illustrations.